Arnold Handyman Services - What do Handyman Services Cover? 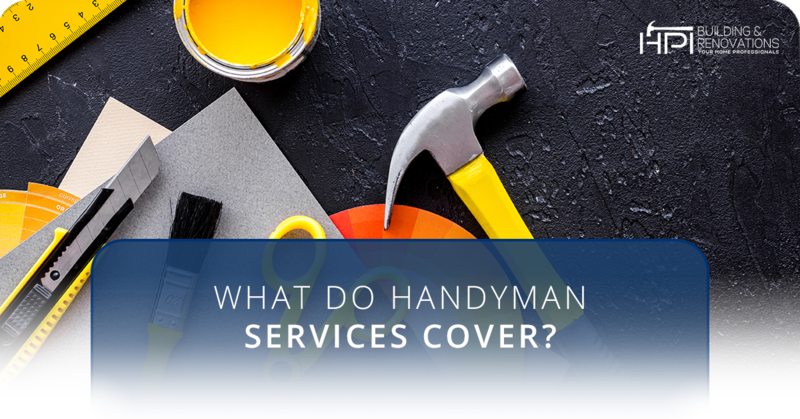 What do Handyman Services Cover? One dilemma that a lot of homeowners have is knowing who to call when they need a repair, renovation, or remodeling job in their home. The list of jobs that can be done under these categories is, after all, exhaustive. It can be quite time-consuming pouring through companies and their lists of services to make sure they can do the job — and whether they’d be the right ones to hire. It becomes even more confusing when you have to make a distinction between a handyman and a contractor. At face value, they seem pretty similar — they both specialize in building and repairing things in the home. Are you torn between a handyman and a contractor? Is knowing their full range of services a dubious matter for you? Let’s break it down. What Services Does a Handyman Offer? Unfortunately, we’re going to have to leave you hanging here and say “it depends.” The reason for this is that the title “handyman” is kind of a catch-all term for someone who has a set of useful home repair and renovation skills. The most important thing to know about a handyman is that they’re not licensed. Anyone can take time to learn the ins and outs of home repair and installation and start selling their services to other people. In many cases, handymen are bona fide professionals who are every bit as qualified as licensed teams. On the other hand, you never know when your handyman might be overselling the quality of their work. In other words, a handyman is typically someone who is confident enough in their skills to offer a variety of home repair and maintenance services. They are not, however, licensed or certified. Because of this, the range of services that fall under the “handyman” umbrella depend greatly on who the handyman actually is. So, when should one hire a contractor, and when should they go with a handyman? It’s a good question, and it depends on your preferences. First of all, it’s important to know that the key difference between the two is that a contractor is professionally trained and certified to do certain tasks. There are general contractors who oversee a variety of different projects, and then there are more specialized contractor positions, such as HVAC specialists or electricians. One good rule of thumb to stick to is this — if the job is complex, or affects entire systems within your home, go with a contractor. Some examples would be electrical work and sewage. You don’t want to mess around with your home’s electric system without proper training — this can be dangerous, so you’ll want to opt for an electrician. Similarly, a crisis in your plumbing, if handled incorrectly, could have consequences all throughout your home. Better to hire a skilled professional. Meanwhile, simple repair jobs can be left to a handyman. If your washing machine breaks down or you need to replace a window, these are tasks which don’t require licensed training. Can Contractors do Handyman Services? In reality, “handyman services” isn’t an official designation for a certain set of jobs. But the answer is yes — contractors can do the jobs that your average handyman can do; it’s just a question of finding the right one. While contractors are generally a little more expensive than a handyman, they also come with the assurance that they’re masters of their craft. Quite often, jobs like the ones listed above are referred to as “handyman services” because they’re all things that a typical handyman might be able to do. Referring to them in this term is an informal way to quickly communicate the nature of our services, though we offer many more that only a contractor could provide! With all this talk of handyman services, you might be thinking about the ones that need to be done in your own home. Do you have a laundry list of home improvement tasks that could benefit from some professional assistance? HPI Building and Renovation is here to help. If you live in or around Arnold, MD, contact us today!